(Image: OddurBen (Own work) [CC BY-SA 3.0 (http://creativecommons.org/licenses/by-sa/3.0) or GFDL (http://www.gnu.org/copyleft/fdl.html)], via Wikimedia Commons)To what extent did the opportunity for the people to write a new constitution for Iceland have its roots in the financial crisis of 2008 and the protests that followed? The street protests of 2008 and 2009 that followed the crash were mostly directed towards the government of the time and the demand for new elections. At the same time there was this very wide dialogue within the society of Iceland where people were trying to diagnose how they could make a better and fairer society. In the streets the loudest demand was not for a new constitution but for changes in the political landscape at the time. However when those claims had been met, we still had to figure out how to change society to try and prevent the same thing from happening all over again. We were looking for big structural, big changes and then the constitution became part of the dialogue about how we can fix this so we don’t have the same disaster repeating itself after a few more years. So it was a consequence of the protests you could say, yes, but it was not one of the loudest demands during the protests themselves, if I remember correctly. To what extent do you think the constitution you ended up drafting would help in preventing another financial crash? I think if it would have been implemented, which clearly it has not been, it could have a preventive influence for such a crash to reoccur. The situation now in Iceland is rather bleak. It seems the same things are repeating themselves that led to the crash in the first place. But since we don’t have a new constitution and we don’t have an amended legal framework that we could count on to prevent this from happening again I have a strong sensation that it will actually be repeated. I certainly believe that if the constitution had been implemented that was written by the constitutional council it would have been much more unlikely. Why? There are some articles about access to information in there. Do you think that’s one of the key things? That’s one of the key things and also the reoccurring theme of transparency and the division of power so that leads to less corruption. And on an island of 330,000 people it’s very hard to avoid nepotism and the strong power holders, for example the owners of the natural resources have unnatural [i.e. undue] influence on the political system. And when we crashed in 2008 I think most Icelandic people thought this was a relatively uncorrupted society. Our perception was we were one of these great model Scandinavian countries where political corruption was very low and our finance system was brilliant and all regulations were being followed and so on. And this was a huge misconception. The reoccurring themes in the new constitution that we wrote really strive to prevent the same system from being established. So it puts in way more checks and balances thereby being able to prevent similar things, like our financial system becoming eleven times as big as our national GDP and so on. It was the parliament that legislated the framework for how the constitution was written. They decided that the Icelandic people should play a leading role in writing the new constitution. Was that just an act of benign generosity or were they forced into doing that? Well this was one of the promises of most of the political parties in the elections in 2009 that they would establish some sort of revision of the constitution with the partaking of the people of the country. So it was something they had promised and they had to deliver because this was a strong claim. And the way they went about it was very radical and quite unique. I’m sure you’re familiar with the process where they had this national forum of one thousand randomly selected citizens brainstorming about what sort of constitution or society they wanted. Then five specialists made a 600-page report about the constitutional situation of Iceland and other nations – a sort of academic overview of most of the things that had been written on the work of the constitutional council. Then we had this national election of 25 ordinary citizens who wrote the constitution. So it was in many ways very special. There was nothing that forced them to go this particular route. But I think it was an honest attempt to really try to have an open process and really try to make as big a change in these matters as possible. Because we have had this task of trying to write this constitution for Iceland since the beginning of our democracy when we got our independence from Denmark in ’44 and we just adopted the Danish constitution to try and speed up that process. And ever since there’s been a promise that the Icelandic nation would get its own constitution but the politicians have been unable to honour that promise because it’s very hard for them being power holders to really write a document that could possibly diminish their power, add more checks and balances and make things more difficult for them. So I think it was an honest attempt to outsource it to somebody that would not be so biased as the early attempts proved not fruitful at all. And then you could ask the question if it was too much of a separation between the legal body and this constitutional council and whether they completely washed their hands of it as soon as they outsourced it because none of them was really willing to fight for it after it was written and make sure it actually took force. Would you recommend this kind of process to people outside Iceland? There seems to have been quite a high level of trust in people that carried out the drafting? Certainly I would recommend it but there’s always scope for improvement and things I would modify if we were doing it all over again. For example, the length of time was ridiculous. You can’t really expect people to write a whole constitution in four months. It’s a little bit crazy. Even though we managed to it certainly affected the quality of the supporting documents and so on. Secondly, the beauty of it was the openness and the crowd-sourcing to a certain degree. That is something that could certainly be modelled in other places. I would try to be more inclusive so that more people were invited to the table. If you look at the group of people who participated in writing it through the Facebook channel and so on they were maybe a bit homogenous – mostly males of a certain age and so on – so if someone else was doing the same project I would strongly recommend more proactive interaction with certain parts of the nation to make sure that the voices of those that have more difficulties in being heard are heard. There are some articles in the constitution that extend direct democracy through allowing people to call referenda and so on… That was one of the hugely debated things. We went really far towards direct democracy. I think we said ten per cent of the population could call for a national referendum and even block a legal act. And two per cent of the nation could put a new agenda to the parliament and so on. So it’s really progressive in regards to direct democracy. Are there other key features you’d like to flag up as being particularly important or significant? Well there are loads of them. I was a member of the committee that was responsible for the human rights chapter and the natural resources and so on. There’s a really strong wording to ensure that the natural resources of Iceland belong to the people of Iceland and not some selected few [Article 34]. And then there’s this protection of nature – not on the normal grounds that it suits people but that nature has a right of its own and that it’s sacred to a certain degree [Article 33]. This is building on an Ecuadorian philosophy and we tried to find the strongest and most progressive ways to ensure these things. You have mentioned the information access [Article 15] which is a complete change. It’s a little bit built on the Norwegian way which basically means everything should be open unless there is a specific reason for it to be closed. So you don’t need to be a person that requests information to access them. The information is there and if there is a reason to close them it you can do it. Instead of everything being closed and then if you ask for access maybe it will be open, everything will be open. And then if you have a well-reasoned case you can close it. So I think that would greatly change how things are done because a lot of the things that go wrong are done because people know that it’s very unlikely that people will ever find out that they messed up, took a short cut or whatever. And we have seen in our past that the way the banks were privatised was severely faulted and I think if there had been more transparency and better access to the public of that decision-making it would never have happened. So we are not trying to correct the big errors of our past but really trying to learn from them and in this document we try to prevent them to the degree that we can. There’s a right to internet [Article 14] which is also new I think and animal rights [Article 36]. So after the national referendum where 67% of the population said they wanted the draft constitution to form the basis for a new constitution for the country, what is the current status of the document? It’s really like a hostage situation. It’s crazy to have a referendum and ignore the results. I think it’s not happened in any modern democratic society for a long time, at least not to my knowledge. Of course this will not be tolerated in the long run. You can only hold the lid on that saucepan for so long before it really explodes. Because now the dialogue has gone really strange. It means if people are demanding referenda they are really sceptical if it has any affect. So it really undermines the possibility of direct democracy which was, in a way, our only hope when we see our political system and the systems of western democracies. Western democracies don’t really provide security for the citizens. They are really ancient in their way. This whole system of political parties and their interests being taken before the interests of the people, it just has to change. We have such global problems at the moment that if we don’t fundamentally change the way we run nation states we will terminate ourselves. It’s crucial that this referendum that was held in Iceland will be honoured in some way. I think the current power holders, the conservatives, realise that. They are really trying now, I understand, to make some of the fundamental amendments to the constitution which are in the document of the constitutional council because they know if they don’t in the end they will pay for it. So we can’t really say at this point in time that it has failed and will not be implemented. It is rather a matter, in my opinion, of how and when it will take force at least to a certain degree. Since March the Pirate Party has been polling as the most popular party in Iceland. Is there a link there with the failure to implement the draft constitution? There is a huge link. 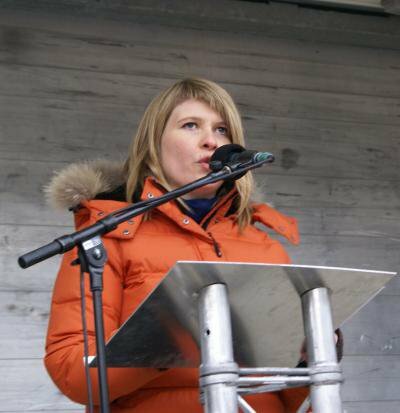 They are the only political party in Iceland that has an honest, open and certain position that they want to fight for this document to become the constitution of Iceland. They had the courage to go to that extreme end of the scale. Not saying ‘OK, some of it.’ They are saying ‘this was a national referendum, we want this to be honoured, we want this to be the new constitution.’ And I think this a huge part of their success recently. Also it’s the fatigue that people have toward the conventional political parties. They just don’t believe in this anymore. If you look at surveys in Iceland they are such a ridiculous low when it comes to the trust people have in parliament that we’re talking about numbers like 10%. Where the police holds the trust of maybe 90% of the population and the universities and so on. So you have the legislative body of a nation state that nobody trusts and that is just a crazy situation. You can’t make laws for people who don’t trust you to make the law for them. You need to reinvent yourself in some way to get the trust otherwise the law will just be broken. And that’s a fundamental crisis that this current parliament is facing. They can’t progress in any way because they are in such strong opposition to their own nation that almost anything they do changes into a sort of mine area where things tend to explode in all directions and this is because the way in which they work hasn’t been changed. That was one of the really big things we were trying to tackle in the constitution is to try to change the way in which the politicians work. Trying to take it away from this big battlefield where I fundamentally disagree with you because of who you are not because of what you say, to a more consensus orientated and quality of work. Not just going forward and doing what you can because you have a majority, but rather trying to research it well and find out is there a middle ground, is there way to find the third solution that is even greater than the two opposite sides. And that was a methodology that we used in the constitutional council, we strived for consensus rather than just override the minority on each and every occasion and I think that proved very successful. That was quite remarkable and something that you decided as a group to use? Yes. What would you say were the key reasons for the resistance to adopting the new constitution? Is it because it particularly challenges the vested interests of the fishing industry, a general perceived loss of power or something else? I think that every opposing party has their reasons. Obviously there are huge opposing forces linked to the huge natural resources of our fisheries that have very strong influence in the conservative parties. And they control what they want in those parties in a way so that’s a huge part of the problem. Another part is some people feel this isn’t good enough, it’s too radical or it’s too big of a change for a little nation to go into. So there’s different reasons for different opponents but again, you can never, ever write a constitution in four months and expect everybody to just say, ‘oh it’s perfect.’ Everybody will have a problem with it to some extent. They will say ‘OK, in my dream constitution this would have been different and this would have been different.’ But you can’t go forward like that because you will never find another solution that is better because if you provide a plan B that is a modified version of the same document, then you’ll get all the same problems again. What you have changed will cause disagreement and unhappiness in another person’s mind and so on. So it’s mathematically impossible to start fiddling with it because there’s an inner balance in this document. And that balance is found in the fact that 25 people all agreed on this after writing it for four months with the input of the people of the country and so on and that cannot be recreated. So this is a bit like the argument where somebody says, ‘give me a starting point to stand on and I will lift the Earth.’ This is a starting point to stand on because this is the only document that we have that was created with this methodology which is hopefully the methodology of the future. So as soon as the politicians start meddling with it, then essentially it destroys the balance and that’s why I believe it’s an all or nothing document. You can of course implement some of the changes within it and that’s positive but you will never be able to write another constitution of Iceland and get an agreement as big as we got in the national referendum because the people won’t trust you. Whoever you are. The people trusted this particular process because of the way it was designed and I think that is the only way to go forward otherwise we will lose. We are a young democracy and maybe it’s OK that it takes us a few years to implement this but I believe it will take force in some shape at the end because I don’t see how it’s possible to have peace with anything else. How might this relate to what is happening in the UK? Before the recent general election here there was a lot of talk about the need for a new constitution and a constitutional convention. But the Conservative Party who won the election have no interest in pursuing this. I think there might be people who might be interested in pursuing the process independently here. Do you think that’s a possibility, or does it need the support of a progressive parliamentary presence? Of course it helps a lot if you can get parliament involved because that means you get the financial support and there’s a lot of facilities that really speed up the process. It’s hard actually to ask people to give all their work for free. Although we would have. We had this crazy point in time where the Supreme Court of Iceland had actually invalidated the referendum [for more on this see the “An Unexpected Hiccup” section of From the people to the people, a new constitution]. Most of the people who had been elected at that time would have been prepared to put everything else aside and just finish this task because it was so important. So I think it’s not essential to have the parliament with you on that one but I think it will speed the process up and make it much more likely to happen. But having said that I think there is this inbuilt resistance in all parliaments towards big democratic changes that will lead essentially to them being less powerful. That is not because they are bad people or in some way evil it’s just the nature of power is that it tries to preserve itself. And therefore I think that at some point people will have to face the fact that it is impossible and do it with different means. But that is a very rebellious way of thinking. In the end you’re saying you’re going to override the democratically-elected leaders and do this ourselves. It’s a very dangerous route to take so I think that any politicians in their right mind would try to solve those big issues and not just think ‘OK I have four years of some brilliance here, I’m going to do whatever I can to increase the leverage of those that support me,’ rather think in the long term. And that’s one of the big problems with the political systems that we have is that they are very short-term based and sometimes they tend to just change everything that the last guy did because they were not on the same side and it’s very destructive for the long run. That’s probably why we have so little being done towards sustainability and so on because this short-term mentality is inbuilt into the democratic systems is very destructive. And I think that’s why we need big and open constitutions like the draft that we did here in Iceland that looks to the future and tries to create a common way in which we go as a nation in the long run. And that’s why I think that British politicians won’t be able to block this forever. This reform is needed. They can stick their heads in the sand for so long but if they don’t try to participate they will be sidelined, I think. Is there anything else you’d like to say that I have offered you the opportunity to say? The only thing I would like to add is that after participating in this experiment or project I became a huge believer in the wisdom of the crowds. You shouldn’t be so afraid of allowing people to take their own decisions through whatever means are possible and that direct democracy – of course you cannot be voting on human rights and so on – but on certain things is the way to go forward because we need to be responsible for decisions we make as a group and that we can only do by making them as a group.See The Independent for Phil England's accompanying overview of the current situation in Iceland.